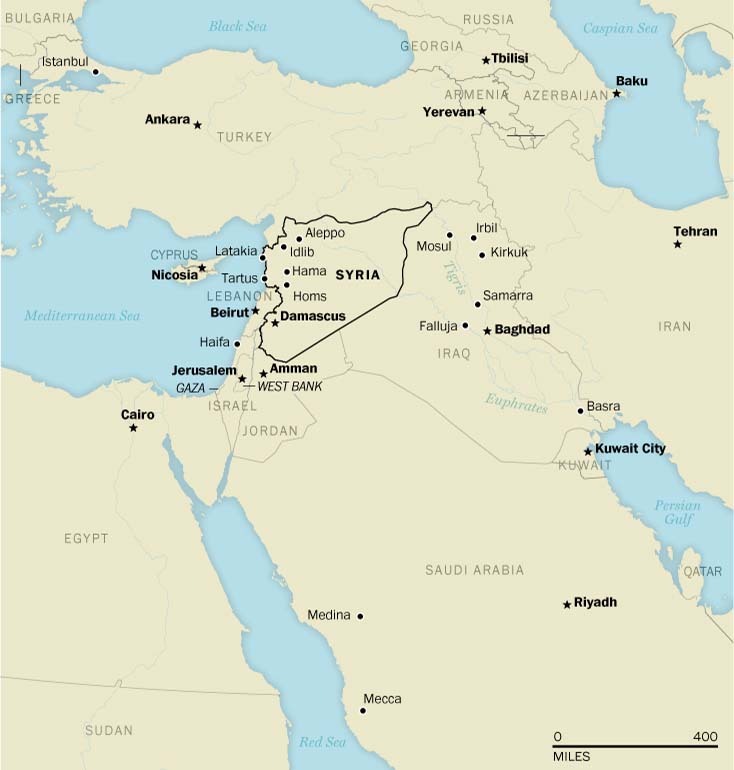 In the early 20th century, Syria was part of a region redrawn by outside forces. Today the 3-year-old uprising against the government of President Bashar al-Assad is generating the outlines of zones of control that could result in the partitioning of the country. The modern map of the Middle East was created by Europeans less than a century ago. Today, the conflict in Syria is calling into question the viability of those borders, which were frequently drawn with little regard for local communities. Existing frontiers are being eroded and new ones are starting to emerge in ways that challenge the very existence of the region’s states. Coming soon to the middle east…….. Revelation 17:12-14………. 12 “The ten horns which you saw are ten kings who have received no kingdom as yet, but they receive authority for one hour as kings with the beast. 13 These are of one mind, and they will give their power and authority to the beast………. The Smoke and the Beast are among the signs of the Day of Judgment, mentioned in the Qur’an and in rigorously authentic narrations. (c) It’s Speech: The Beast will address the people with the words of Allah, “Mankind did not believe in our signs.” [27: 82] Others stated, quoting ibn `Abbas, that “speaking” refers to the action of the Beast in differentiating the believers and disbelievers. An important point to note is that many of the opinions regarding the beast may not have sound basis in the texts. As such, believing in these subtle details is not necessary, except that which has come in the authentic narratives of the Prophet (Allah bless him). This includes, first and foremost, believing in the coming of the Beast itself, a point established decisively in the Qur’an, as well as it being a sign of the Last Hour, its speaking to people, and its task of differentiating the believers from the disbelievers. Details regarding its appearance, where it will arise from, what it will say, and so forth, are matters of secondary importance. The safest route is to consign these modalities and details to Allah, while realizing that ultimately we will all return to Him to be judged for what we did in our worldly life. Well, cookie. They duel with the same basic concept – that God is the reason … which conveniently answers your big question …. but only quoting from the prose of different humans over a long time. And it is too simple for some to say ‘Godly treatment of fellow animals’ is the main concept, and the rest is the fiction of ‘old sciences’. We used to believe a tooth-fairy could drop change too – mommy said so. I prefer to think the ‘spirit of God’ is in the animal we have become with the larger brain … and we know how we should be treating each other if we wish to survive as a species. (barring natural events, of course) We just don’t too often, and that’s why we write about it – to try to pass on some knowledge. But some of those ancient cryptographers loved to stick in a pack of silly extras, didn’t they? The Islamic belief in Tawheed is uniquley unitarian, and islaam is counted as one of the worlds monothiestic religions along with judaism and christianity. However according to the islamic unitarian concept (tawheed) christianity is concidered polythiesm and judaism is concidered a subtle form of idolatry. Thus, the principle of tawheed is very profound and needs further classification even among the muslims. This point is vivdly illustrated at the point that muslims like muhammed ibn alee ibn arabee, understood tawheed to mean monism; That everything which exists is allaah and allaah is everything. Yet such beliefs among mainstreem muslims is concidered panthiesm. an aspect of tawheed is asmaat was sifaat (names and attributes) which requires man not be given attibutes of allah. EG. In the new testament SAUL commonly known as paul takes the figure of milchezedek, King of Salem, from the torah [genisis 14:18-20] and gives both him and jesus the divine attribute of having no beggining or end. 1. For this milchizedek, King of Salem, Priest of the most high God, met Abraham returning from th salughter of the kings and blessed him,, and to him Abraham apportioned a tenth part of everything, He is first by translation of his name, King of rightousness, and he is also King of Salem, that is, King of peace. HE IS WITHOUT FATHER OR MOTHER OR GENEOLOGY, AND HAS NEITHER BEGINING OF DAYS NOR END OF LIFE BUT RESEMBLING THE SON OF GOD, HE CONTINUES A PRIEST FOREVER. shiite sects(excluding zaidites of Yemen) have given their ‘imams’ the attribute of absoloute infabillity, knowledge of the past, future and the unseen the ability to co0ntrol destiny and control over the atoms of creation. in so they set up rivals who share gods unique attributes and who in fact become gods besides allah. We see that these sects deviated from the straight path on tawheed (monothiesm and work hard to neutrilize the principle of tawheed. Among them also are those who negaters of allahs existance. In the 19th and 20th century a group of european phillosiphers asserted the non existance of god which became known as “Death Of God Philosphy” The germen philosopher “Phillip Mainlander” in his principal writing ” The philosophy of redemption” states that the world begins with the death of god, since god is a principle of unity shattered in the plurality of the world, and a principle of joy denied in the world of suffering which dominates the world. We all know the story of moses and his ending quoted in torah bible and quran. Thankyou for taking the time in reading 5th. I hope i didnt fall short and address a an ideaology in a baseless way because explaining them properly is what is important so one can properly understand the one god concept. Hence i provided resources as evidence. I visited the church in Damascus, made where Saul fell off his horse and had a vision after bashing his head on the ground …. now a couple of levels below the street … and then became ‘Paul’ – an apostle. Stopped killing people. History preserved in some places by ‘belief’ in it’s importance. A good thing. An experience that is also preserved a lifetime i bet. Curiously, I have a mind that remembers some things too … little moments in the stream, if you like … almost photographic in itself. But I can’t show all of those. Hey crosswinds , I have a feeling the beast of the earth that will talk to people , and as as the bible says “worship” could be GROSS MATERIALSM. and the number of the beast will be the way we do business with as a number . (maybe microchipped) . Obviously the antichrist, (dajjal) will be in the picture , and deceive anyone he reaches, (via media) etc . We are all easy targets in this materialistic , media driven world. May Allah help us. Ameen. Thanks for you polite response, and your view. I hope we can continue to remain civil . In John 2:22 who would the anti Christ be ,is it (anyone who denies the trinity)? And Allah through the quran sends many chilling warnings to us. The greatest lie (sin) is to say something of God that he is not. (Ie human). Allah can forgive any sin before you die except unrenpented “shirk” . shirk is associating partners with God. (Ie trinity etc) . God is not one in 3 or 3 in one but only one. Even from the beginning the first four commandments have to do with the oneness and worship of one God. I do not believe the Quran is the Word of God. It might acknowledge Jesus was a prophet, but they crucified Him because He said He was God, the Messiah of Israel, and savour of the world. So it does not matter to me, what it says. I bow to no one except Jesus Christ, the express image of the invisible God, for which I would probably be beheaded in some parts of the middle east for such a confession…. 1 God, who at various times and in various ways spoke in time past to the fathers by the prophets, 2 has in these last days spoken to us by His Son, whom He has appointed heir of all things, through whom also He made the worlds; 3 who being the brightness of His glory and the express image of His person, and upholding all things by the word of His power, when He had by Himself purged our sins, sat down at the right hand of the Majesty on high……. Without Jesus Christ, we are lost. Plain and simple. Humans break the law in Word, thought and deed daily. The only perfect One is Jesus, the only sinless one, who took our sins on the Cross. If you don’t accept Jesus Christ as Gods only Way to Eternal Life, you will die in your sins. He is the One who crucifies the sinful nature in us, because He lives within Christians by the power of the Holy Spirit…..
77. “So worthless will be their deeds” in the sense that they will be of no avail to them in the life after death, even though they might have considered them as their great achievements but the fact is that they will lose all their value as soon as the world shall come to an end. When they will go before their Lord, and all their deeds shall be placed in the scales, they will have no weight at all whether they had built great palaces, established great universities and libraries, set up great factories and laboratories, constructed highways and railways, in short, all their inventions, industries, sciences and arts and other things of which they were very proud in this world, will lose their weights in the scales. The only thing which will have weight there will be that which had been done in accordance with the divine instructions and with the intention to please Allah. It is, therefore, obvious that if all of one’s endeavors were confined to the worldly things and the achievement of worldly desires whose results one would see in this world, one should not reasonably expect to see their results in the Hereafter, for they would have gone waste with the end of this world. It is equally obvious, that only the deeds of the one, who performed them strictly in accordance with His instructions to win His approval with a view to avail of their results in the Hereafter, will find that his deeds had weight in the scales. On the contrary, such a one will find that all his endeavors in the world had gone waste. While the purpose of the parables is to teach a spiritual lesson, these are not the literary tools that an anti-capitalist author would employ. Jesus’ pro-capitalist bias couldn’t hit one over the head any harder. Mathew 5:17″Do not think that I have come to abolish the Law or the Prophets; I have not come to abolish them but to fulfill them. Every man shall bear his own burden – All must answer for themselves, not for their neighbors. And every man must expect to be dealt with by the Divine Judge, as his character and conduct have been. The greater offenses of another will not excuse thy smaller crimes. Every man must give account of himself to God. Here are Some interesting quotes from important people below . Because you show interest , it is my duty to at least point you to the guidance that continues to attract the souls that are still searching. maybe you have not yet accepted Mohammed as the last prophet and messenger of God , but dont you think carefully consideration should be made before rejecting him. After all it is a big claim that 1.5 billion billion people believe is true. And our eternal soul is at stake. The people that don’t hear or try to obey gods word will be left wandering , just like isolated tribes, and the hard of heart. Only because I love you a brother in humanity and hopefully in faith. If you want me to stop, I will respect your wishes , otherwise feel free to have inter religious dialogue with me. See another interesting link about science and Islam. C’mon crosswinds is that your best comeback. Now your just being ignorant. Oldest original Aramaic bible found in Turkey. 12 proofs that Muhammef (PBUH) was a true prophet of God. 1. Muhammad (may Allah’s blessings and peace be upon him) was raised illiterate, unable to read or write, and remained like that till his death. Among all his people, he was known as being truthful and trustworthy. Before receiving revelation, he had no prior knowledge of Religion or any previously sent Message. He remained like that for his first forty years. Revelation then came to Muhammad with theKoran that we now have between our hands. This Koran mentioned most of the accounts found in the previous scriptures, telling us about these events in the greatest detail as if he witnessed them. These accounts came precisely as they were found in the Torah sent down to Moses and in the Gospel sent down to Jesus. Neither the Jews or Christians were able to believe him regarding anything that he said. 2. Muhammad (may Allah’s blessings and peace be upon him) also foretold of everything that wouldoccur to him and his community after him, pertaining to victory, the removal of the tyrannical kingdoms of Chosroes [the royal title for the Zoroastrian kings of Persia] and Caesar, and the establishment of the religion of Islam throughout the earth. These events occurred exactly as Muhammad foretold, as ifhe was reading the future from an open book. 3. Muhammad (may Allah’s blessings and peace be upon him) also brought an Arabic Koran that isthe peak of eloquence and clarity. The Koran challenged those eloquent and fluent Arabs of his time, who initially belied him, to bring forth a single chapter like the Koran. The eloquent Arabs of his day were unable to contest this Koran.Indeed, till our day, none has ever dared to claim that he has been able to compose words that equal-or even approach-the order, grace, beauty, and splendor of this Glorious Koran. 5. Allah instilled great love for Muhammad (may Allah’s blessings and peace be upon him) in the hearts of all who believed in and met him. This love reached such a degree that any of his companions would willingly sacrifice his (or her) self, mother or father for him. Till today, those who believe in Muhammad honor and love him. Anyone of those who believe in him would ransom his own family and wealth to see him, even if but once. During every generation, from his day till our time, the believers in this Noble prophet have fullyadhered to his teachings. With some, this has reached the degree that they desire to follow and adhere to the Prophet’s way in his personal matters regarding which Allah has not sought of them to adhere to in worship. For example, some will only eat those specific foods or only wear those specific garmentsthat the Messenger liked. Let alone all that, all those who believe in Muhammad repeat those praises of Allah, special prayers,and invocations that he would say during each of his actions during day and night, like: what he would say when he greeted people, upon entering and leaving the house, entering and leaving the mosque, entering and leaving the bathroom, going to sleep and awaking from sleep, observing the new crescent, observing the new fruit on trees, eating, drinking, dressing, riding, traveling and returning from travel, etc. Let alone all that, all those who believe in Muhammad fully perform-even to the minute detail-every act of worship-like prayer, fasting, charity, and pilgrimage-as this Noble Messenger (may Allah’s blessingsand peace be upon him) taught and as he himself performed.All of this allows those who believe in him, to live their lives in all aspects with this Noble Messenger as their example, as if he was standing before them, for them to follow in all their doings. 9. Since his day, in every region of the earth and during every period, this Noble Prophet has beenfollowed by individuals from all races, colors and peoples. Many of those who followed him were previously Christians, Jews, pagans, idolaters, or without any religion. Among those who chose to follow him, were those who were known for their sound judgment, wisdom, reflection, and foresight. They chose to follow this Noble Prophet after they witnessed the signs of his truthfulness and the evidences of his miracles. They did not choose to follow Muhammad out of compulsion or coercion orbecause they had adopted the ways of their fathers and mothers.Indeed many of the followers of this Prophet (may Allah’s blessings peace be upon him), chose to follow him during the time when Islam was weak, when there were few Muslims, and when there was severe persecution of his followers on earth. Most people who have followed this Prophet (may Allah’s blessings and peace be upon him) have done so not to acquire some material benefits. Indeed many of his followers have suffered the greatest forms of harm and persecution as a result of followingthis Prophet. Despite all this harm and persecution, this did not turn them back from his religion. My brethren! All of this clearly indicates to anyone possessing any sense, that this Prophet was truly and really Allah’s messenger and that he was not just a man who claimed prophethood or spoke aboutAllah without knowledge. 10. With all this, Muhammad came with a great religion in its credal and legal make-up. Muhammad described Allah with qualities of complete perfection, and at the same time in a manner that is free of ascribing to Him any imperfection. Neither the philosophers or the wise could ever describe Allah like such. Indeed it is impossible to imagine that any human mind could conceive of an existing being that possesses such complete ability, knowledge, and greatness; Who has subdued thecreation; Who has encompassed everything in the universe, small or large; and Who possesses such perfect mercy.Nor is it in the ability of any human being to place a perfect law based upon justice, equality, mercy and objectivity for all human activity on earth like the laws that Muhammad brought for all spheres of human activity – like buying and selling, marriage and divorce, renting, testimony, custody, and all othercontracts that are necessary to uphold life and civilization on earth. 11. It is impossible that any person conceive wisdom, morals, good manners, nobleness of charactersas what this honorable Prophet (may Allah’s blessings and peace be upon him) brought. In a full and complete manner, Muhammad spread a teaching regarding character and manners towardone’ parents, relatives, fiends, family, humanity, animals, plants and inanimate objects. It is impossible for the human mind alone to grasp all of that teaching or come with a similar teaching. All of that unequivocally indicates that this Messenger did not bring an) of this religion from his own accord, but that it was rather a teaching and inspiration that he received from the One Who created the earth and the high heavens above and created this universe in its miraculous architecture andperfection. 12. The legal and credal make-up of the religion that the Messenger, Muhammad, (may Allah’sblessings and peace be upon him) brought resembles the engineering of the heavens and the earth. All of that indicates that He who created the heavens and the earth is the One Who sent down this great law and upright religion. The degree of inimitability of the Divine law that was sent down upon Muhammad is to the same degree of inimitability of the Divine creation of the heavens and earth. For just as humanity cannot create this universe, in the same manner humanity cannot bring forth a law like Allah’s law that He sent down upon His servant and messenger Muhammad (may Allah’s blessings and peace be upon him). Revelation is the final Revelation…..
We see that these sects deviated from the straight path on tawheed (monothiesm and work hard to neutrilize the principle of tawheed. Among them also are those who negaters of allahs existance. In the 19th and 20th a group of european phillosiphers asserted the non existance of god which became known as “Death Of God Philosphy” The germen philosopher “Phillip Mainlander” in his principal writing ” The philosophy of redemption” states that the world begins with the death of god, since god is a principle of unity shattered in the plurality of the world, and a principle of joy denied in the world of suffering which dominates the world. I visited the church in Damascus where Saul fell off his horse and had a vision after bashing his head on the ground …. now a couple of levels below the street … and then became ‘Paul’ – an apostle. Stopped killing people. History preserved in some places by ‘belief’ in it’s importance. A good thing. Without Jesus Christ, your toast my friend. Plain and simple. You break the law in Word, thought and deed daily. The only perfect One is Jesus, the only sinless one, who took our sins on the Cross. If you don’t accept Jesus Christ as Gods only Way to Eternal Life, you will die in your sins….. I dont get it, there isnt a fence between two countries? There are borders, kind of like imaginary fences. You should be able to understand that, after all you have a very vivid imagination. In Israel they want to put a fence through ancient monastery lands growing crops – which will kill the crops because they can’t be tended. Who’s great ‘mapping’ idea is that? Fencing indeed. WHY should Anyone need a fence, IF they agree on the usage? Many farmers of the ancient lands called ‘Palestine’ were pushed away in many places – even with their ‘family deeds’ from before the Ottoman days. Because someone somewhere draws a line on a map? Doesn’t make good neighbours, a fence. The ‘heads’ after WWI didn’t do very well with planning in many places, since they still had a sort of ‘winner’ attitude … and caused WWII by impoverishing the Germans, actually – Like Turkey does to the Armenians. Changed the attitude a little after WWII and helped Germans … and Russians too, even if their politics stank to high heaven. But the Middle East lines devolved and were redrawn again to create a ‘safe place’ for the first ‘One God’ religion. And Religion is the stupidest idea for creating anything economically viable, right?? It’s the craziest idea for dividing it too. um maybe because when Arafat rejected the Clinton Parameters (an offer for a state) and started the second intifada, hundreds of suicide bombers went all around Israel blowing up buses and cafes, and thousands of Israelis were killed. I personally remember a restaurant by the beach being blown up (28 killed) and also a bus full of people. After the security barrier was built, suicide bombings went down by 99%. Yah. I saw the news. I agree. Too sad. And as the article and history show, it becomes a case of ‘retaliation’ on all sides. 18 sect/tribes going at each other’s throats all the time …. forever. Just wait for a palestinian state, within a week the PA will collapse and every day you’ll read about rocket attacks in Gen Gurion airport and central Tel Aviv. No scotch and smokes either. 😉 But there IS a ‘return’ plan now – if they can convince NASA to ‘allow’ it (30 yrs holding it back so far) – problem being that it obviates the ‘great NASA’ plan of playing expensive leapfrog which was their pet. But seriously. They can produce fuel for return journeys there. Machine for that is already made. If people WANT to go, why is anyone holding them back? Power of the ‘Sun God’. As always, the best. :-)) Earth’s oil can be for the wheels. Not multiverse … just a huge one with many possibles … and we’ll never know if we don’t look. Same as sailing a ship off the edge of the earth, we seek to know. Other very similar life-forms I think ARE probable … we know the ingredients that are needed for ours. And yes, some believe we came from there originally … to ‘settle in’ once the planet cooled down and had an atmosphere we could breathe. But this is doubtful, I think … knowing how far and dangerous the journeys would need to be. My favorite question: Why is there something instead of nothing? Then maybe you should read a recent book named: ‘A Universe From Nothing’. Then only ask, ‘Why Not’. I exist, therefore I am. And that’s about it. P.S. Doesn’t mean I should be bored by that. And I attempt to beat the ‘average’ life-span, with just enough sleep. Send Dennis rodman and Kim junk puke there and see how long their friendship lasts before the A1 sauce comes out with a Jeffery dahmer recipe. No bjs, I’ll jump back in no time!! Its terrible, its not like going on holiday somewhere on earth then just book a return ticket when you get fed up, literally no way of getting back if NASA doesnt invest in a return journey. The ‘heads’ after WWI didn’t do very well in many places, since they still had a sort of ‘winner’ attitude … and caused WWII by impoverishing the Germans, actually – Like Turkey does to the Armenians. Changed the attitude a little after WWII and helped Germans … and Russians too, even if their politics stank to high heaven. But the Middle East lines devolved and were redrawn again to create a ‘safe place’ for the first ‘One God’ religion. And Religion is the stupidest idea for creating anything economically viable, right?? No Israel and no Palestine, correct. There was a geographical region called Palestine. People lived in this region and they were Jews, Muslims, and Christians (maybe more I don’t know about). Nation-states did not exist in the region until the Brits and French carved it up and created borders. I guess Sunni will have more land.